Learn the Moirs Point Mangawhai story! Moirs Point Mangawhai rests on a stunning coastal headland with idyllic harbour views and easy access to the water’s edge for aquatic play. Mangawhai or “Stream of the Stingray” relates to the stingrays within our harbour. John and Martha Moir gave their name to the area from 1868 and it became known as Moir Point. John Moir crewed on a cutter, running trips from Mangawhai to Auckland. 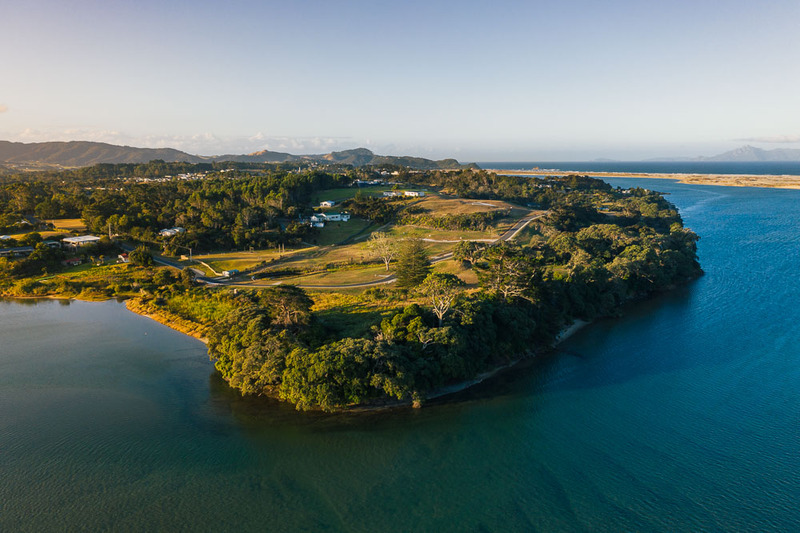 From the turn of the century until 1920, he operated a punt boat taking children from Mangawhai Heads to the new school at Mangawhai Village, and in the 1940s, John & Martha’s daughter, Margaret, and her husband, Leon, donated a few acres for Moirs Point Christian Camp. Moirs Point Mangawhai officially began in 1958. Starting with just five acres of bare land, several volunteers spent their weekends rowing building materials across the estuary on a high tide, bringing to life the ‘main camp’ at Moirs Point. The doors swung open with a strong conviction to help everyday kids. This modest venue went on to host hundreds of kids camps, helping to foster young boys (and later girls) into worthy citizens. While that spirit still echoes at Moirs Point Mangawhai, our vision has evolved. We now welcome all groups – at every age and stage in life. Over time, a further 25 acres was secured. Future dreams would simmer away and eventually the old staff house was remodeled in 2013 to create lodge 3 – a fantastic four-bedroom home conveniently located between the main camp and the new lodges. In 2014, lodges 1 and 2 were built in rural Putaruru and trucked onsite. Behind the physical growth and expansion, is a strengthening of our vision – our heart. We have grown from a kids camp, to an all-encompassing centre. A place where visitors can expect warm hospitality, a respite from busy lives, a sense of connection and a pledge towards sustainability. Our retreat sits in a unique backyard with a rich history. Unfolding along a stunning estuary, wrapped in native bush and a chorus of birdsong – we are caretakers of this land with a sense of responsibility to keep it pristine for future generations to enjoy. At the heart of our centre is a vision that’s bigger than us. We are Moirs Point Mangawhai Christian Centre. The word ‘centre’ means the middle, essence, or heart of something. For us, Christian values are ‘our heart’, they form our vision for today, tomorrow and into the future. The heart is an essential organ and it guides us in our work. The survival of our heart relies on us staying aligned to its truth. We want the beat of it to be felt in everything we do. From humble daily choices, to the bigger ones – whether visiting, staying or working with us, we have a calling and its wrapped up in hospitality and helping our community. Even in the smallest of gestures like swapping gardening tips, teaching water skills, recycling, or zooming down the water slide, right through to making the world a better place – we want people to feel nurtured, energized, connected and curious. Lavish time on your family – reconnect and detox from technology, invest in your learnings as a church group, build stronger corporate teams, or foster friendships as a school group. Whatever brings you here, welcome to our stunning retreat, we hope you have the best time possible! Large capacity accommodation designed to host school groups, kids camps, churches, organisations and large family groups. Complete with bunkrooms, dining/hall, and commercial kitchen – the focus is on having fun! Three lodges perfectly designed for families, church groups, or smaller groups. Lodges 1 & 2 capture panoramic views of the estuary, dune and ocean beyond. From this idyllic setting – connect with family and friends, escape daily routines, seek knowledge, relax and leave restored. This includes the fellowship you can expect while staying with us, but also extends to the wider community. From volunteering labour, widow support, hosting Mothers groups, giving away fresh daffodils in spring – wherever possible, our heart branches out to people in need. Our location couldn’t be more incredible! We are blessed with land, sea, native bush and wildlife. We pledge to look after it, treading lightly where we can – recycling, exploring solar energy, using eco-products and saving energy, planting natives, creating new gardens and caring for our existing ones. Our work has just begun! Mangawhai is rapidly growing and we are focused on improving and expanding. We have room to create more amenities without compromising on our unique coastal and country heritage. There are some exciting plans for the future which will better accomodate more people in this beautiful and unique location. We hope you’ll join us in our piece of paradise!